Our Finchley Clinic offers first class treatments for Acne and Acne& scarring such as Obagi systems , NeoStrata and Derma roller treatment. The CLENZIderm M.D. System is a treatment available only on prescription and contains a very special ingredient. The patented Benzoyl Peroxide (BPO) penetrates deep into the skin to treat the acne where it starts. Working on the acne at the root penetrates deeper than other BPO products. Our qualified member of staff will assess the level of your acne scarring and decide the system best suited to your needs. Here at our Finchey Clinic we also recommend the CLENZIderm M.D. Systems products that help to maximise your results. There are three distinct stages associated with Nu-Derm® use: Repair stage, Improvement stage, and Final stage. In each stage the skin moves through its transformation, until healthy skin is achieved. Use of sun protection is essential when using any skin care product. At this stage, if creams have been applied correctly, damaged layers of skin have been removed and replaced with new, healthy skin. Skin is strengthened and reaction is less. Obvious improvement in the skin can be seen at this stage. At this stage, skin is renewed and medical objectives have been achieved. The time to achieve the best possible skin condition is variable and depends on the skin damage before starting the treatment. After the treatment is complete the doctor will usually recommend a maintenance program. 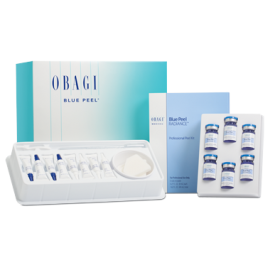 Obagi Blue Peel Radiance. This peel is a superficial exfoliation peel that improves your skin look, texture and feel in a matter of minutes and with little to no down time. It improves a range of skin concerns, including photo damage, pigmentation and skin texture making it look more radiant. To achieve the best results a course of 4 to 6 treatments is recommended. Dermaroller™ provides advanced micro-medical skin-needling, a procedure that stimulates the skin to regenerate and repair itself naturally and safely, creating smoother, brighter, healthier, younger-looking skin. It is quickly gaining popularity in UK, all over Europe and USA. It does not cause any damage to the skin. The microneedling stimulates the production of collagen and elastin. These are the key building blocks of skin. A typical dermaroller has 192 needles; the roller is rolled about 6 to 8 times (back and forth in three directions). This will lead to over a thousand needle entries, all of which will act to stimulate new collagen fibres. This will increase the thickness and improve the scarring, wrinkles and aged damaged skin due to aging. The Microneedles of the dermaroller penetrate the epidermis and dermis layer of skin. The process is well tolerated but some clients may find it uncomfortable. We will numb your face with local anaesthetic for approximately 45 minutes before performing the procedure.